The Garden Guys ‘Green Your Garden’ Review and Giveaway! It is time to get down and dirty!!!! Spring is here and I’m gonna play in the dirt. The garden fence is going up and the dirt is ready to work ( Yeah! I know we are strange… we let our chickens run free and pen up our garden). I am one of those old fashioned gals who cans and preserves. More than 300 jars of good homemade stuff last year. You can see how my garden is important. I am somewhat famous around here for my applebutter, sweet salsa and of course the zuchini/squash relish I make. What I am getting to is you must have good soil to get the results that I demand of my garden. So what do you need to get good healthy soil? Well travel across cyberspace with me to The Green Guys website and you can find the products and tips you need to grow that fantastic garden, flowerbed, and lawn. When I was young, dirt was something to make mudpies with (sorry sis, but you were gullable enough to eat it). Now I want to be more organic and natural when it comes to feeding my garden. Soil is a living ecosystem. Microorganisims like bacteria, protozoa, fungi, nematodes, along with earthworms all help build a healthy organic soil. The Garden Guys highly recommend Mother Natures Cuisine to feed these organisms. 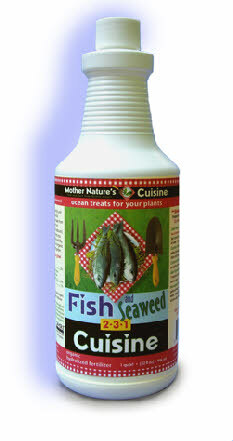 Mother Natures Cuisine provides a slow release of nutrients to give your plants what they need when they need it. I recently moved my Firepower Nandina bushes. Risky I know. It was quite a shock to them. When we replanted them I added a mixture of Mother Natures Fish and Seaweed Cuisine to each bush. Although they looked shaky for a couple of days, they took hold and have settled in to their new home just fine. The infamous Garden Guys (Layanee, Sam and Jim) have a weekly radio show on 96.9fm out of Boston on Sunday mornings from 6:00 to 9:00 est. You can also listen to their podcast on their website. You can call in to the show, too! Check in This Sunday (4/3) around 7:15 am central and CHECK out who is on the show with The Garden Guys….ME ME ME! I highly recommend The Garden Guys as the go to place for info and products to green your garden and lawn. Would you like to feed your soil? 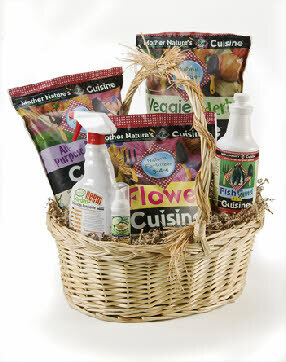 The Garden Guys offer a ‘Green Your Garden’ Basket full of products to help you give your garden and lawn a feast! AND one Espacularaiesa reader will recieve one!!!! 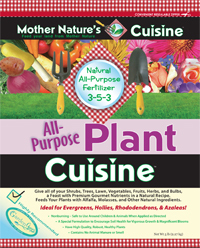 Mother Nature’s Cuisine Flower Cuisine Fertilizer -5 lbs. BONUS ENTRIES – You can do any or all you want. Leave separate comment for each one. Don’t forget to vote for me for Mom Central Grant program on Facebook. (upper right on this page).3 entries /3 comments. 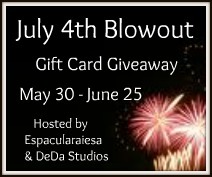 Giveaway ends April 13, 2011 at 11:59. Winner will be notified by email.